-Albany returns from the All Star Break with a 20-14-4-5 mark, good for 49 points and 4th place in the Northeast Division (9th in the Eastern Conference). -On Monday, Tim Sestito was placed on waivers by New Jersey. Tuesday he cleared and was returned to Albany. He appeared in 15 games with two assists and 33 penalty minutes. -The AHL announced Wednesday that defenseman Seth Helgeson will sit out Thursday’s game in Lehigh Valley due to suspension, thanks to an elbowing incident in Worcester on Friday night. 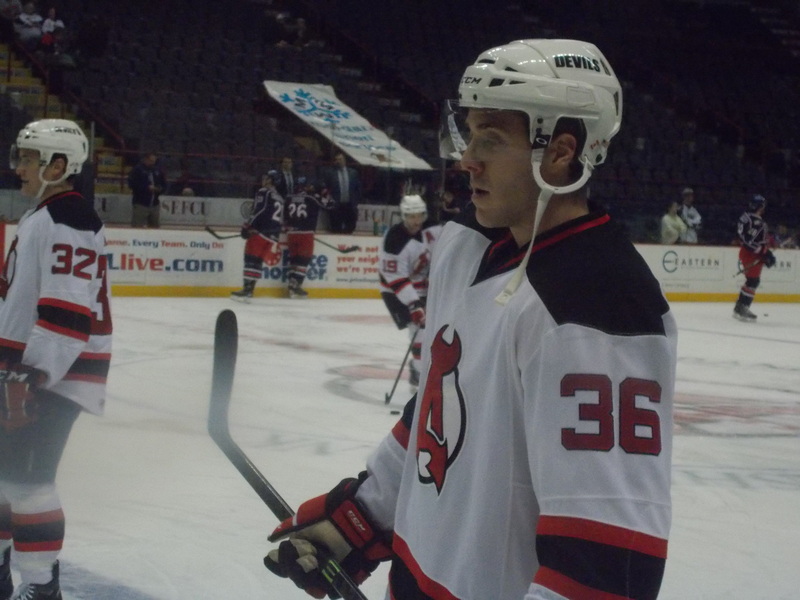 -Defenseman Mike Keenan, on a PTO since December 4th, was officially signed to an AHL contract on Wednesday. He has one assist in 15 games and 15 penalty minutes. -The Phantoms broke a 3 game losing streak just before the break with a win at home against St. John’s on Saturday. -Lehigh Valley is also starting a 3 in 3 week, hosting Hershey on Friday before traveling to Wilkes-Barre on Saturday. -The Phantoms got a boost in goal when Philadelphia sent Rob Zepp back on Wednesday. When: 7:00 PM (1/30), 5:00 PM (1/31). 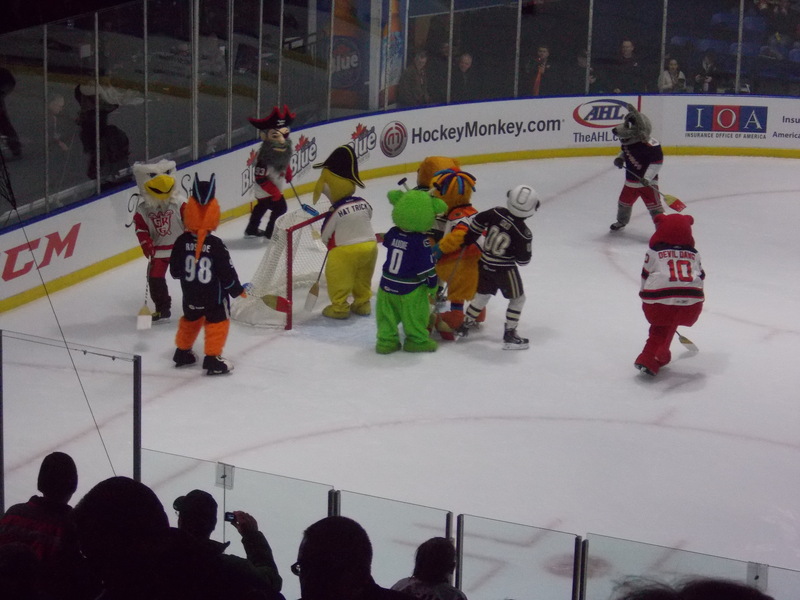 -This is a rematch of last year’s first round Calder Cup playoff series, won by the IceCaps in 4 games. They would make it all the way to the Calder Cup Finals before losing to Texas in 5 games. -The IceCaps are finishing off a 5 game road swing, so far going 1-2 against East Division opponents with their only win in Binghamton on Friday evening. -Connor Hellebuyck, the lone St. John’s representative at Monday’s AHL All Star Classic, got the starting nod for the Eastern Conference and stopped 9 of 13 West shots in his one period of work. -Local ties: Former River Rats forward Nicolas Blanchard is in his first season with St. John’s and first outside of the Carolina organization. -The first 1500 in attendance on Saturday get their very own Dan Kelly bobblehead doll. No, not THAT kind of streaking. But a streak did continue for the Devils this week leading up to the All Star break…a 2-0-1 week extended their point streak to 6 games, keeping them in the playoff race. Wednesday: A wrong was made right, as Paul Thompson was named as a last minute replacement to the AHL All Star team. 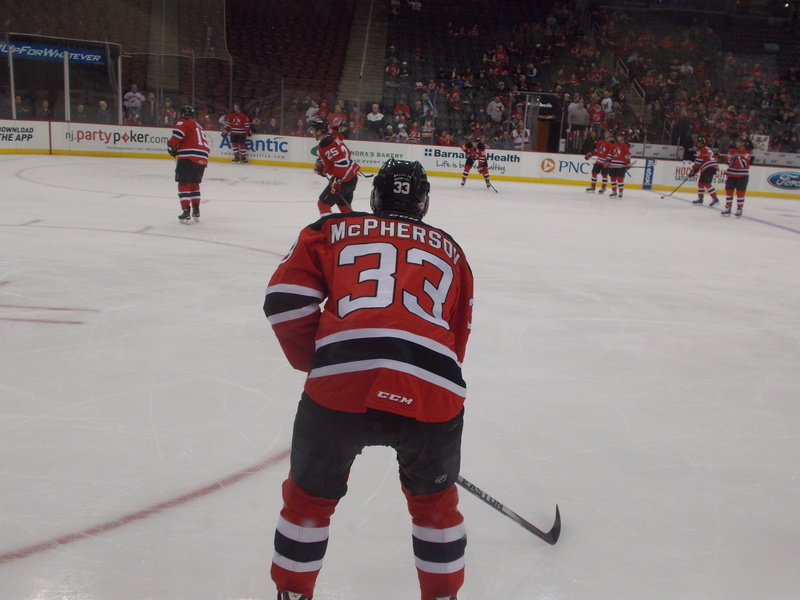 It was off to The Rock, otherwise known as Prudential Center, in Newark as the Devils played host to Bridgeport. And the home team got off to a fast start, as Ben Thomson and Paul Thompson (on a power play) scored 1:02 apart midway through the first period for a 2-0 advantage. John Persson would cut the lead in half with a power play tally of his own, the first Albany penalty of the night. 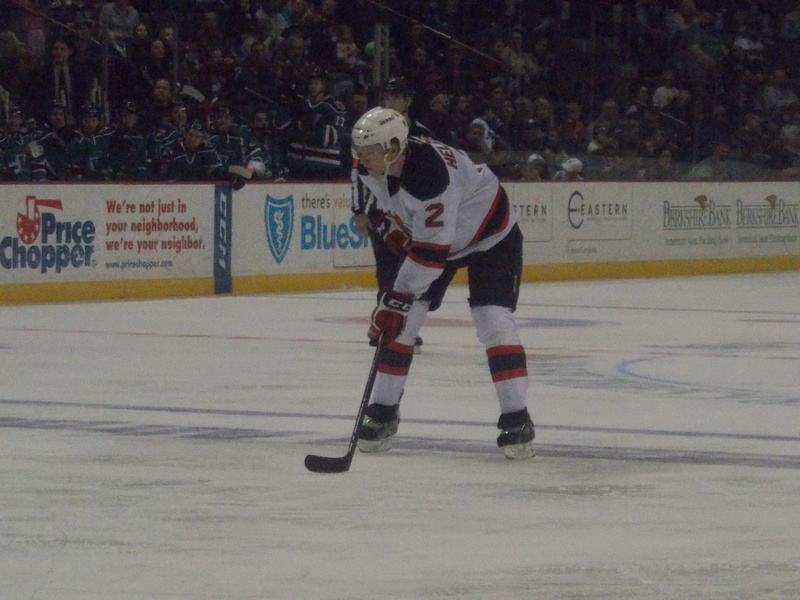 The Devils turned it up in the second, as Stefan Matteau (power play) and Thompson would get his second of the game to make it a 4-1 lead, chasing Kevin Poulin out of the Bridgeport net in favor of David Leggio. The switch gave Bridgeport a little momentum, as Persson would score his second of the game 30 seconds later to make it 4-2. Colin McDonald would add a shorthanded goal late in the period to make things interesting. But Joe Whitney, in his first game back after being sent down by New Jersey, would get an insurance goal, the third power play goal of the evening, early in the third to seal the win. Scott Clemmensen stopped 31 of 34 shots in net and picked up his 4th win. Reece Scarlett had his second straight career game, picking up 3 assists and earning first star honors. 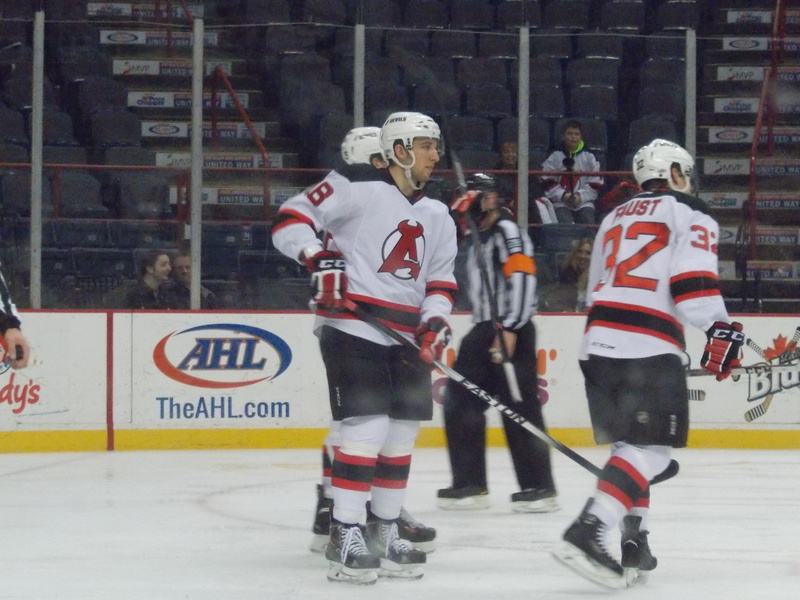 Mike Sislo and Kelly Zajac had two helpers each, while Darcy Zajac, Seth Helgeson, and Whitney each had one assist. Highlights via AHL Live can be found here. It was due east to Worcester on Friday night, as the Devils visited the Sharks for the first time this season. And it was going to be a challenge: Worcester was working on an 8 game winning streak, and also just received the services of Tomas Hertl from San Jose with the NHL on All Star Break. Well, challenge accepted. Joe Whitney would get Albany on the board first with his 16th goal of the season. David Wohlberg would follow up late with a laser shot of his own, his fourth. All that on just five shots against Sharks goaltender J.P. Anderson. Albany locked it down in the second, only allowing two shots and adding to the lead on a Brandon Burlon goal. But Worcester was not about to go away quietly…on one of those shots Mirco Mueller would score on a power play to break up the shutout. Things nearly got out of hand in the third defensively for Albany…Worcester doubled up their entire shot goal for the game (13 compared to 7 over the first two periods), and Evan Trupp would score to make it 3-2. But at the end of it all, the Devils would hang on for dear life and escape with the win, extending their point streak to 5 games and ending Worcester’s winning streak. Maxime Clermont earned his third win in net, stopping 18 of 20 shots. Burlon and 5 other Devils each had assists. But, peace was soon restored, and pregame continued on. Unlike the night before, it was the Sharks who came out flying in the first, outshooting Albany 16-7. But nothing was getting by Scott Wedgewood, or his counterpart J.P. Anderson for that matter. The scoreless trend continued into the second…until Gus Young broke the tie with less than a minute remaining in the period. Albany would finally get on the board with just over four minutes remaining in regulation, thanks to a power play goal by Paul Thompson, his 22nd. The game carried into overtime, where during the three on three portion Dylan DeMelo would get the game winner past Wedgewood, giving the Sharks the extra point and another Albany overtime disappointment. Wedgewood played extremely well in taking the hard luck loss, stopping 38 of 40 shots. The top line of Thompson, Joe Whitney, and Kelly Zajac had all the Albany offense. And it was a good day at the gate, as a season high 7012 fans were in attendance thanks to Kids in Free Day. 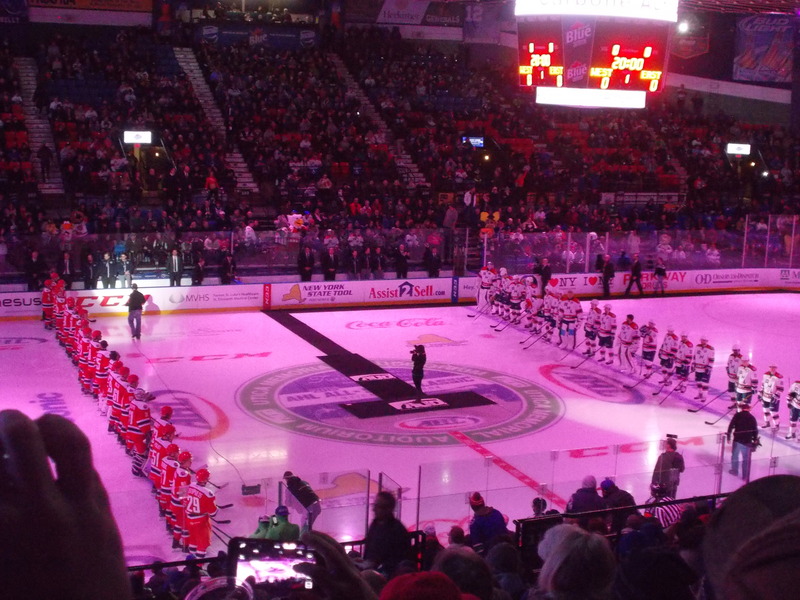 Pop Quiz: Since the AHL brought back the All Star Classic in the 1994-95 season, which year did Albany have the most representation? The answer upcoming. A very good week for Paul Thompson, as he gets a better late than never All Star nod and scores three times, taking over the league goal scoring lead. On Wednesday, Bell scored twice, including the eventual game winner, as the ECHL All Stars defeated Orlando 8-4 in Florida. He was named the game’s Most Valuable Player. Baier registered a first period assist for Orlando. Injury Update: No timetable for Scott Timmins (ankle), Graham Black (wrist), Cam Janssen (upper body). Raman Hrabarenka (cheekbone) is still practicing, but no word on his return. While Joe Whitney and Paul Thompson head to Utica for All Star festivities, the rest of the Devils get a 4 day break. But it’s back to work Thursday, as Albany travels to Allentown to take on the Phantoms for the last time this season. Then it’s back to home ice on Friday and Saturday for a two game set with St. John’s, a rematch of last year’s first round Calder Cup playoff series. And I’ll be in Utica for both All Star events as well, my first time ever going! I do plan on a post midweek wrapping up the skills competition on Sunday night and the game on Monday. Pop Quiz Answer: A total of 5 players represented the River Rats at the 1998 All Star Classic in Syracuse, when Canadian-born players were pitted against those born in the US and Europe: Brendan Morrison, Peter Zezel, and Geordie Kinnear represented the Canadian All Stars, while Jay Pandolfo and Vlastimil Kroupa represented PlanetUSA. The Canadian All Stars defeated PlanetUSA 11-10. The rest, including a few fight photos, all over on the Facebook page. -Albany begins the week with a 18-14-3-5 record, good for 44 points and 4th place in the Northeast Division (8th in the Eastern Conference). 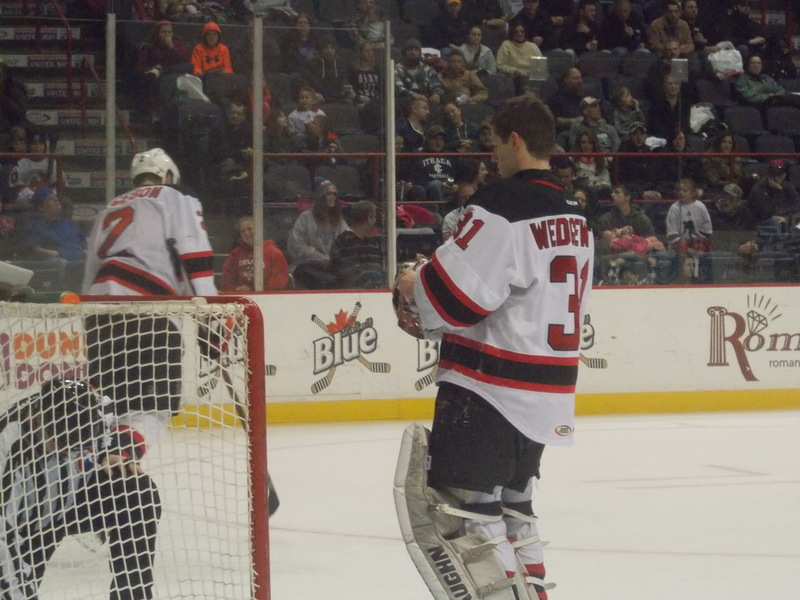 -With New Jersey starting their All Star Break on Tuesday, Joe Whitney has been sent back to Albany. In his latest callup he appeared in two games and was scoreless. In turn, Myles Bell was returned to Evansville, where he will particpate in tonight’s ECHL All Star Game in Orlando. He was recalled on December 30th but never saw game action. Where: Prudential Center, Newark, NJ. Season Series: Bridgeport leads 5-4. -Bridgeport is coming off a 1-1-1 weekend, losing to Providence in overtime then splitting a 2 game set with Syracuse on home ice. -After seeing the Sound Tigers for nearly 1/3 of the first half, this is the final regular season matchup between the two teams. 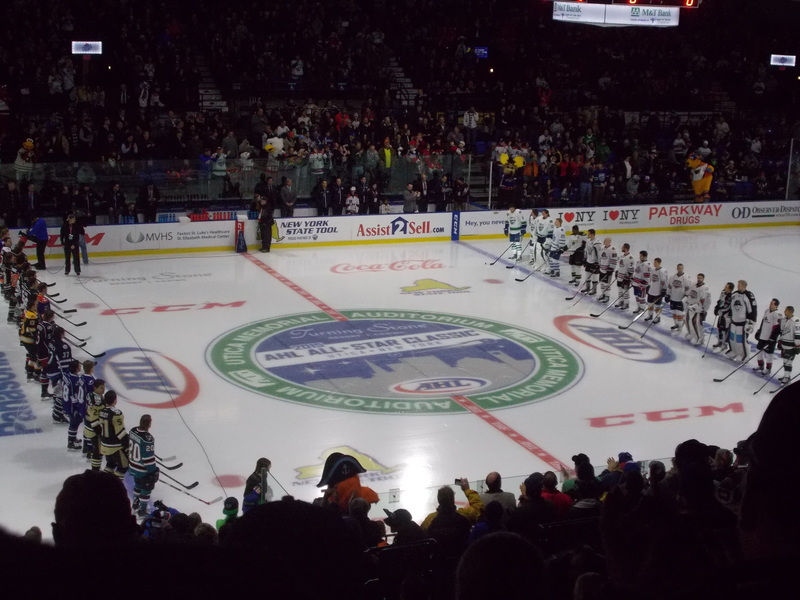 -This is Albany’s third visit to New Jersey for a home game this season. They won the first two in Atlantic City against Lehigh Valley on November 28th and December 14th. 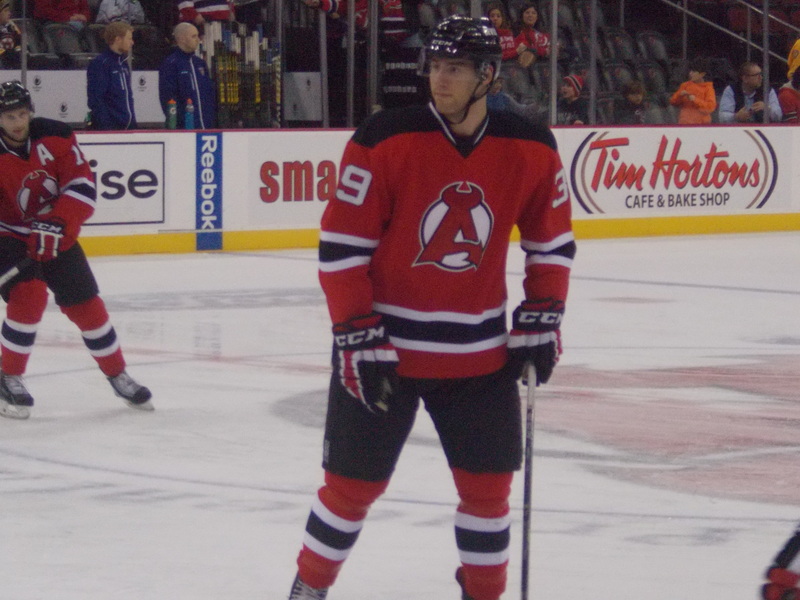 -This is also the first appearance for a Devil AHL team in Prudential Center since February 3, 2010, when Lowell dropped a 3-2 overtime decision to Hartford. The goal scorers that night? 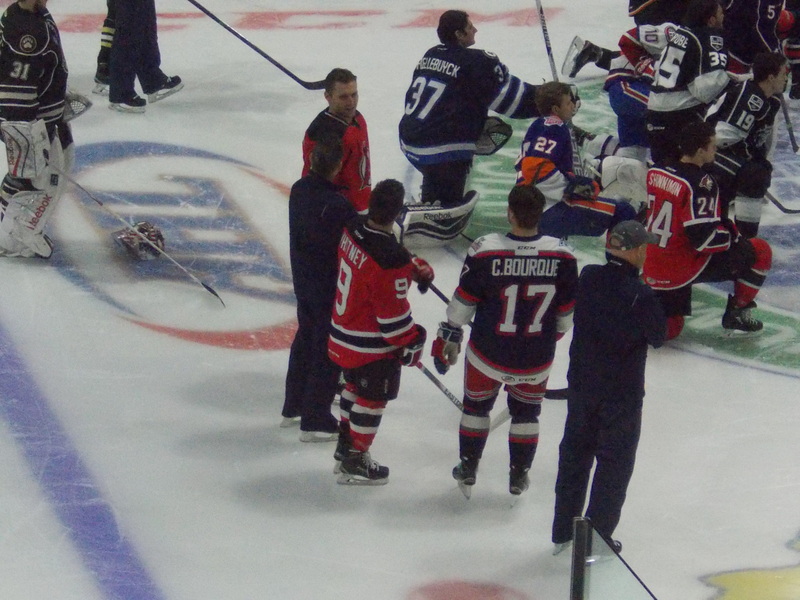 Tim Sestito and Nathan Perkovich. 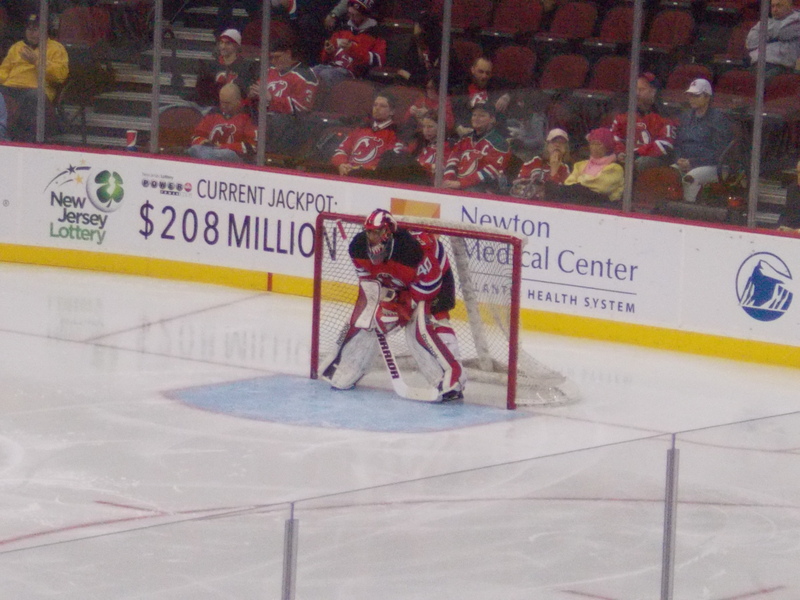 Current Portland goaltender Mike McKenna took the loss in net. -The Sharks start the week the hottest team in the AHL, rattling off seven straight wins. They travel to Portland on Wednesday before the weekend series with the Devils. 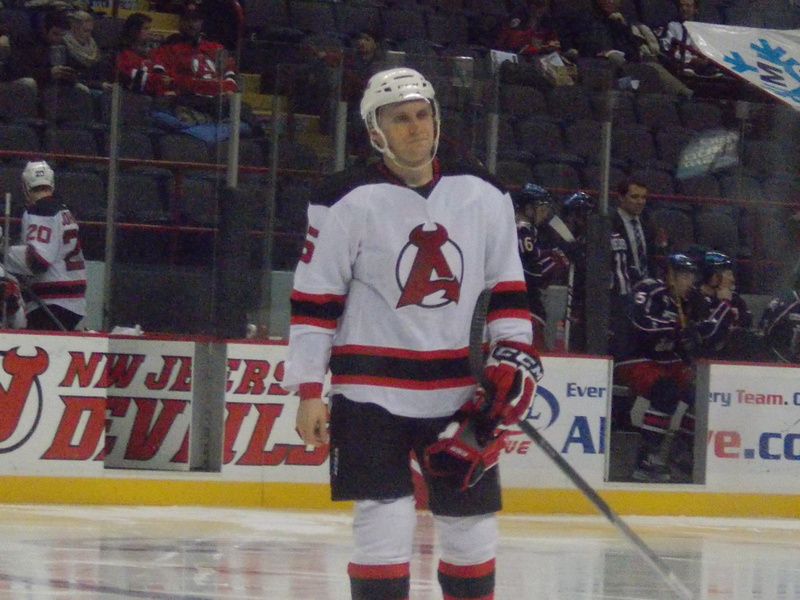 -Local ties: Former Devils defenseman Matt Taormina is the Sharks’ lone AHL All Star representative. 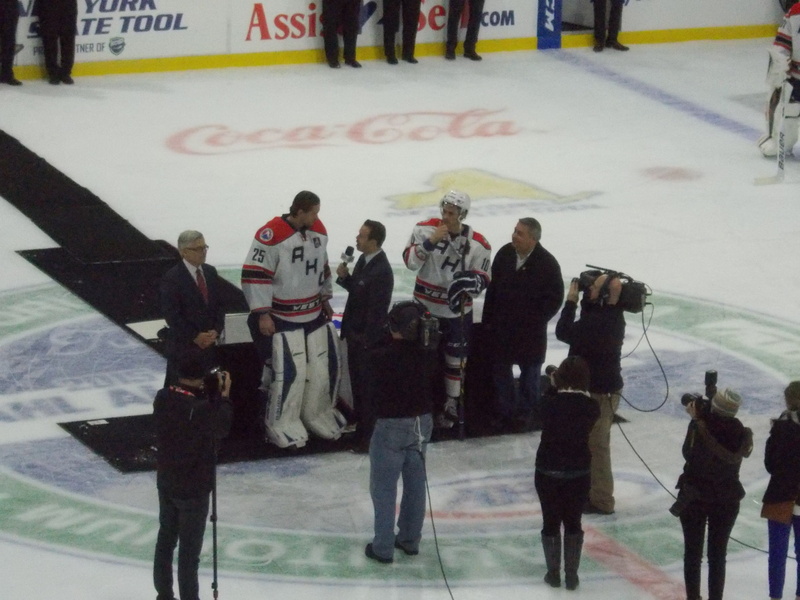 Troy Grosenick, former Union goaltender, is in his second professional season. 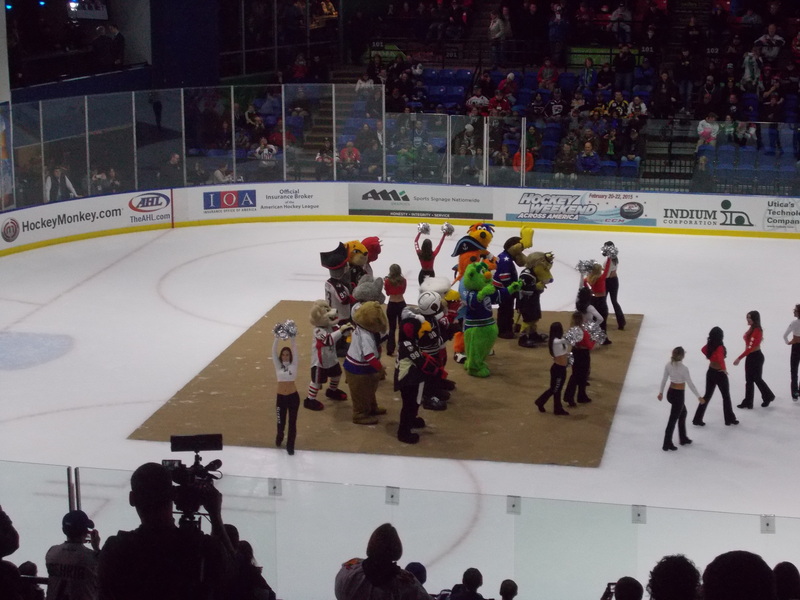 -Saturday is a busy day in downtown Albany for the home half of the series: it’s GE Kids in Free Day and Devil Dawg’s birthday (meaning multiple mascots around the building). It’s also the first half of a hockey doubleheader at the Times Union Center, as RPI takes on Union for the annual Mayor’s Cup in the nightcap. The way things had started in all three games for the Devils this week, this potentially could have been a disastrous recap. But finally doing something that hadn’t happened all season–coming back when trailing after two periods–in back to back games helped springboard Albany to a 5 out of 6 point week, a very nice recovery, getting them out of the Northeast Division basement and back in the playoff race. The week began with the back end of a home and home series against the first place Falcons. A rematch in net between Scott Wedgewood and All Star Anton Forsberg started out the same way as Sunday in Massachusetts, keeping both teams off the scoreboard in the first period. Kerby Rychel put the visitors on the board with just over three minutes remaining in the second. And that looked like all Forsberg would need, as he cruised into the third period. But then something miraculous happened. With Wedgewood pulled for the extra attacker, Paul Thompson would find the back of the net with just 56.8 seconds to go in regulation, tying the game up and getting Albany at least one very important standings point. Just as both teams switched over to 3 on 3 during overtime, Dan Kelly (originally credited to Darcy Zajac) managed to poke the puck past Forsberg, giving Albany an improbable come from behind win, their first all season when trailing after two periods. Wedgewood played well in net, stopping 29 of 30 shots and picking up his sixth win. Four Devils added assists. Friday: Good news and bad news for Eric Baier. Good: His PTO turned into an AHL contract for the remainder of the season. Bad: With Seth Helgeson back on the roster, he was reassigned to Orlando. In 12 games he had one goal (in his season debut on November 23rd) and two assists, finishing at a -3. It was off to Allentown to start a two game Pennsylvania road swing, as the Devils visited the Phantoms for the first time in the regular season (if you recall, they traveled there in the preseason, skating away with a victory on October 4th). Albany was lucky to escape the first period without giving up a goal, getting outshot 10-5 and having to kill off 3 separate power plays. During a 4 on 4 early in the second, Nick Cousins would get a goal just over the glove of Scott Clemmensen to put the hosts up 1-0. 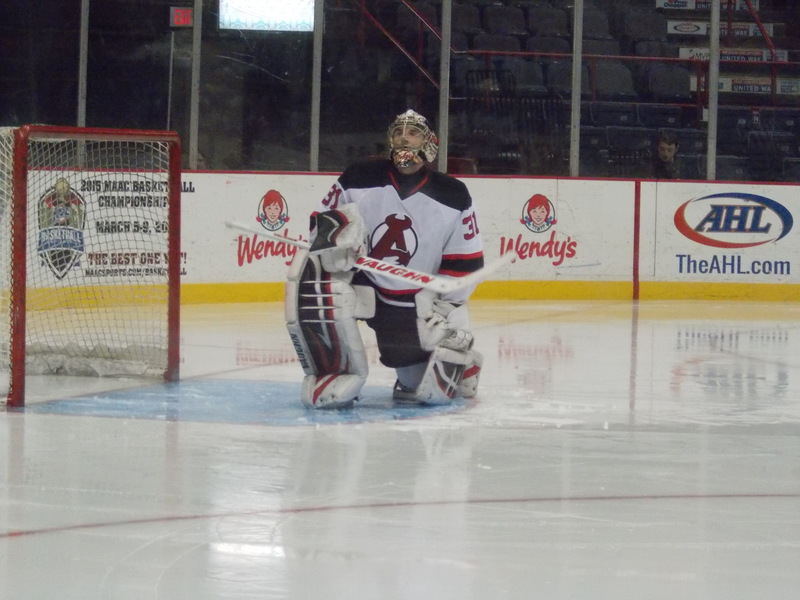 Albany did wake up a little in the second with 19 shots on goal, but nothing got past rookie goaltender Anthony Stolarz. But the rally began in the third, thanks to more whistles. Just after a power play expired, Rod Pelley would tie the game up at 1. Midway through the period, just 23 seconds into another power play, Paul Thompson would put the visitors ahead with his 19th of the season. But Andrew Gordon would re-tie the game just over a minute later. Then on power play #9 of the night, Stefan Matteau would score the go ahead goal for a 3-2 win. Scott Clemmensen stopped 32 of 34 shots in picking up his third win, his first since returning from the mumps, and even got an assist. Albany went 2 for 10 on the power play and killed off all 7 shorthanded situations. Matteau, Dan Kelly, Reece Scarlett, Seth Helgeson, and David Wohlberg all had helpers. It was off to Chocolatetown for the first time this season as Albany faced off against the Bears. And things didn’t get off to a great start–Casey Wellman scored just 10 seconds into the contest. Tomas Kundratek would add a power play goal three minutes later, putting the visitors in a very early hole. 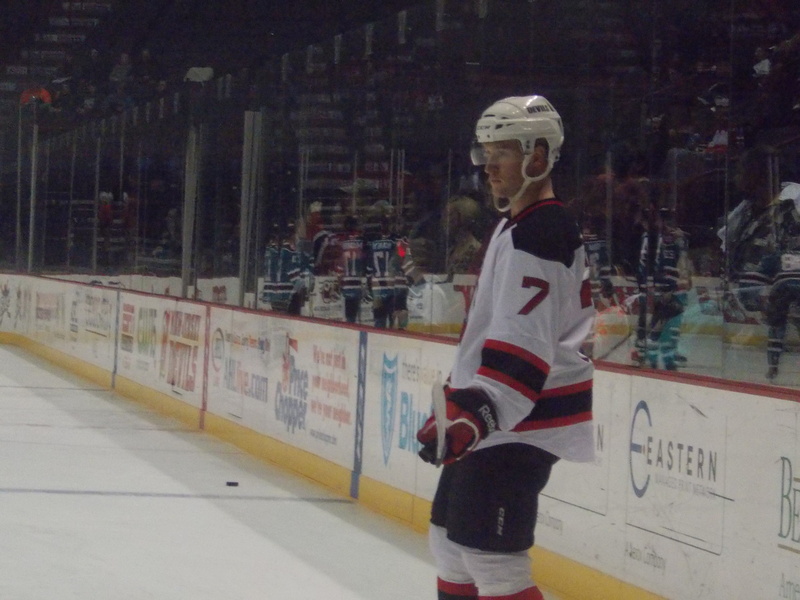 But Albany would rally to tie it up on a Stefan Matteau power play goal (his second in two games) and Reece Scarlett’s first goal of the season (doing his best Eric Gelinas impression in the process). The Bears would retake the lead on a Stanislav Galiev goal. Did I mention this was all during the first period? The back and forth continued during the second period, as the Devils rallied yet again. Darcy Zajac would score his 4th on a power play to re-tie the game, only to have Chris Conner take the lead back on a power play breakaway chance. But on a 5 on 3 opportunity, Reid Boucher would tie things up again with his 11th. Things would get quite physical after that, as both Chris McKelvie (two fighting majors) and Dan Kelly (elbowing major) all were tossed from the game, while Seth Helgeson (continuing altercation) spent most of the third in the penalty box. 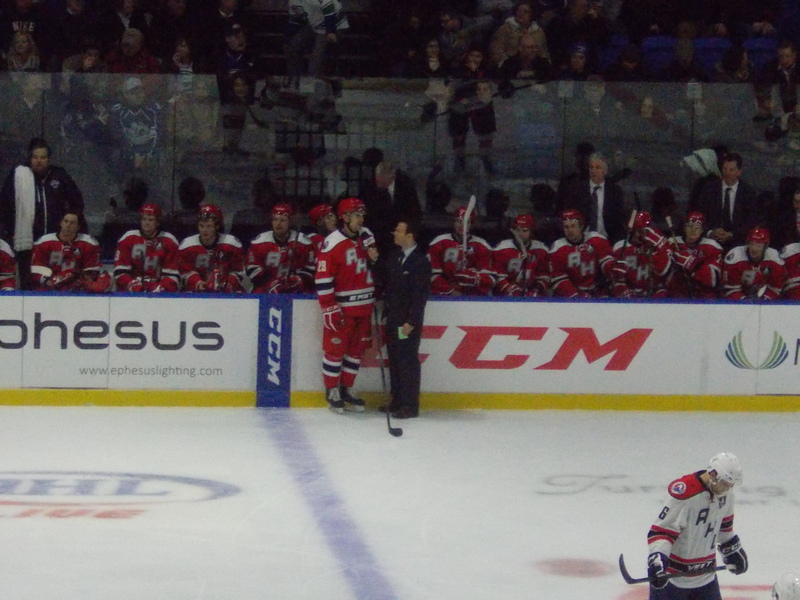 Albany did manage to kill off the five minute major midway through the third, and made it to overtime. But a perfect week was not in the cards. With Rod Pelley in the penalty box on a questionable slashing call, Galiev (on his birthday no less) would score the game winner in a 4 on 3 situation with 3:14 remaining in overtime to give the Bears the extra point. Scott Wedgewood recovered from a shaky first to stop 24 of 29 shots. Scarlett added two assists, while Matteau and three others each had helpers. 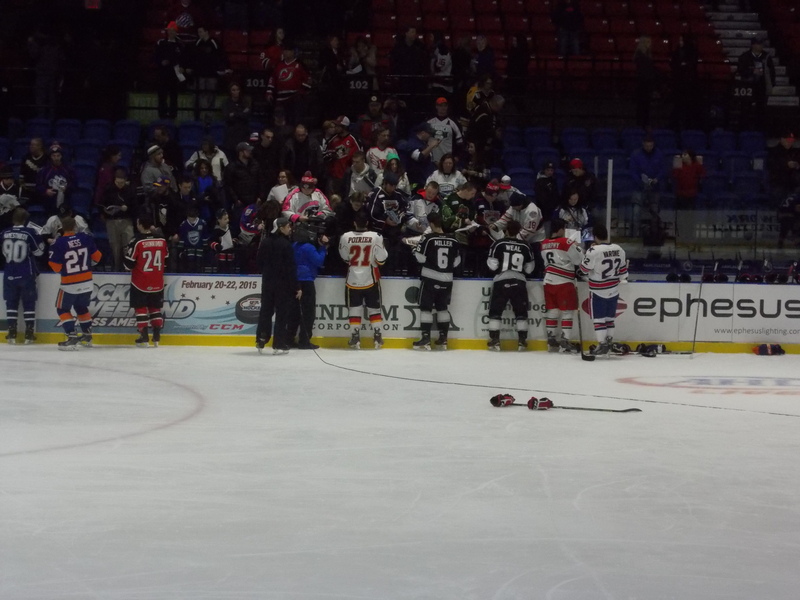 Both teams combined for 113 penalty minutes, with Albany amassing a season high of 65. Pop Quiz: In the Albany Devil era, what is the biggest deficit the team has faced before coming from behind to win? The answer coming up. 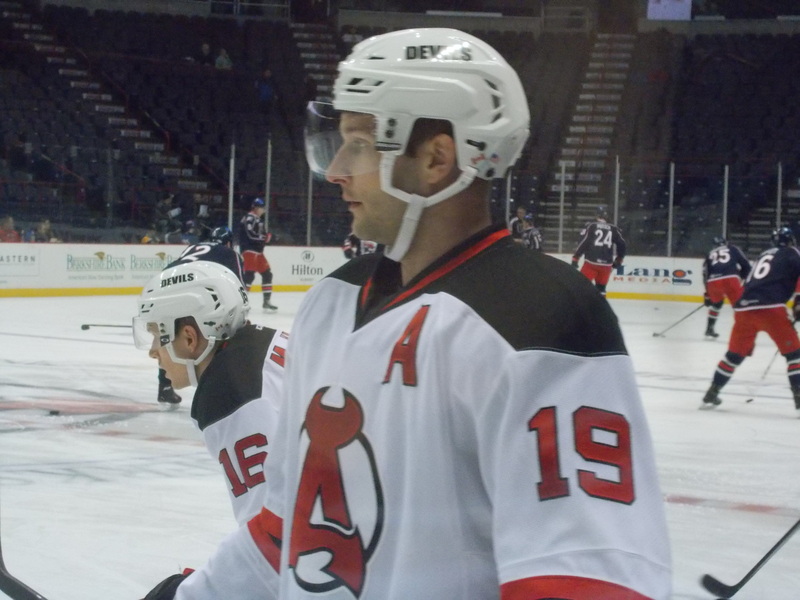 Darcy Zajac reminding everyone of the old Albany-Adirondack days with this one. Nice to finally see Stefan Matteau have a breakout week. Assist on the game winning goal on Wednesday, followed up by multi point efforts in both road contests, including two power play goals. Injury Report: Raman Hrabarenka (facial) is practicing, but no word on when he will return. Graham Black (upper) and Scott Timmins (lower) remain out. This Week’s Schedule: Three games leading up to the AHL All Star Break. 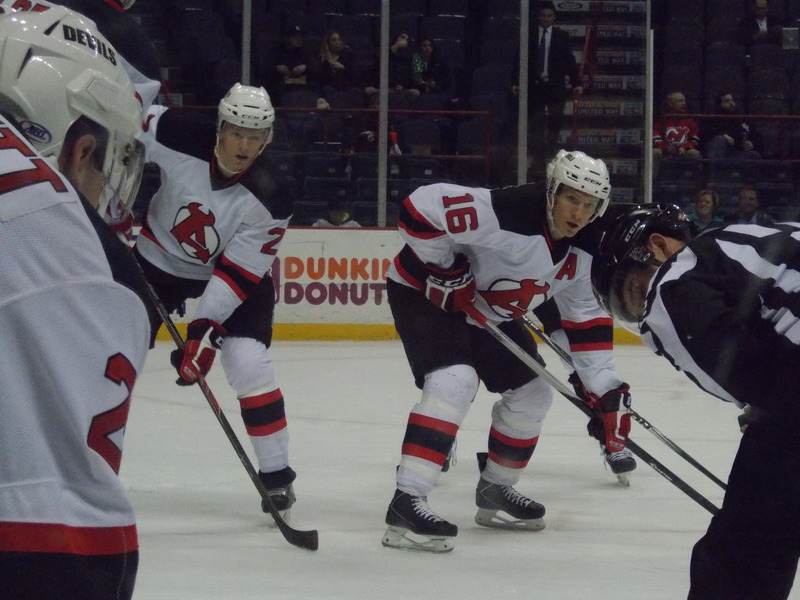 Wednesday the Devils finish up their season series against Bridgeport on home ice. New Jersey’s home ice, that is, as the game is at Prudential Center (and I will be in attendance!). Friday and Saturday sees a home and home against Worcester, with Friday night in central Massachusetts and a quick turnaround at home early Saturday afternoon, as the front end of a local hockey doubleheader (RPI and Union will play the nightcap in the annual Mayor’s Cup matchup). Pop Quiz Answer: The biggest deficit overcome by an A-Devils team? Four goals. 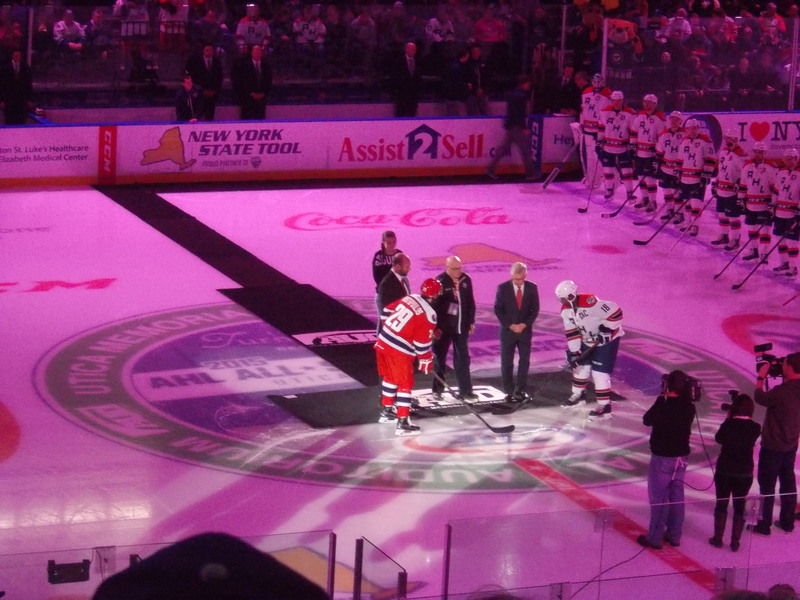 On January 6, 2012, Albany entered the third period trailing Norfolk 4-0. But in a span of 11 minutes and 47 seconds, Nick Palmieri, Mike Hoeffel, Matt Anderson, and Eric Gelinas would all score, forcing overtime. And Joe Whitney finished off the comeback 3 and a half minutes in, giving Albany a 5-4 win. Back in 2011, they overcame a 4-1 deficit in the third on two different occasions, winning 5-4 against Worcester on February 18 (no one remind coach David Cunniff about that night, his pen throwing incident late in the third lead up to the winning goal), and a 5-4 win against Bridgeport on March 9 (the Chad Wiseman 4 goal game). As always, extended gallery over on the Facebook page.